Hanami is a Japanese celebration where people celebrate the flowering of the Cherry Blossom trees. The celebration originated in Japan, yet the celebration has been able to inspire Macon, Georgia to have a similar celebration with identical trees. The Cherry Blossom Festival in Macon is called the “International Cherry Blossom Festival”, and Macon is known to be the Cherry Blossom Capital of the World because 300,000 sakura (meaning Cherry Blossoms) trees grow in the city. The trees bloom in late March. The festival last for ten days which consists of activities, carnivals, food venders, music, parades, and street performances. The streets are filled in downtown Macon. A replication of the Japanese lantern commemorates the Cherry Blossom Festival. Origins:Cherry Blossom trees are not native to the South. 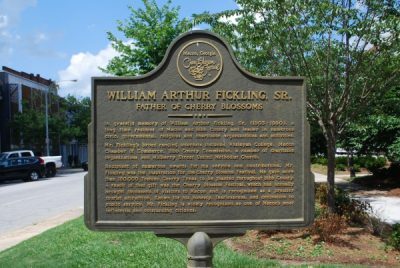 Willian A. Fickling Sr., a local of Macon, enjoyed the one Cherry Blossom tree in his backyard, but he only could identify his tree after a trip to Washington DC where he was able to careful compare the two trees. After careful scrutiny between his tree and the cherry blossom trees in Washington DC, he was able to identify the two as identical trees. In 1973, 500 Cherry Blossom trees were planted around Macon and quickly became popular in the Macon community. The first festival began in spring of 1982. ?